When I was in Boston a few weeks ago, I decided it was time to go find a burger spot I had been looking for in Cambridge. But this was not your usual burger spot. 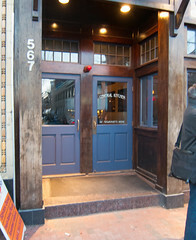 I first found this place when looking for a cocktail in Cambridge, having gotten a recommendation for “Brick and Mortar” along with an address of 567 Massachusetts Avenue. Heading there, however, I only found Central Kitchen, a fairly well-recognized dinner establishment, and no cocktails. But…. see that unmarked door next to Central Kitchen? Through that lies Brick and Mortar, one of Cambridge’s Speakeasies, known for interesting cocktails and good bar food. 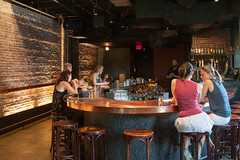 Brick and Mortar is actually a rather cozy little bar (which makes for a pleasant drinking experience during the early evening, but by late evening the place quickly becomes crowded, with a long wait list to get in). 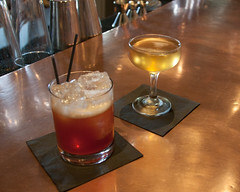 The cocktail list at Brick and Mortar is quite impressive, and they are definitely in on the current trend of using bitters, gins, and other botanicals to make some very interesting cocktails. Past victuals that were particularly pleasing include the “Lido Shuffle” with Cocchi, Aperol, Chartreuse, and Lemon, or the “Gail Collins” with Mezcal, Sloe Gin, and Bitters. But on my first two visits, it wasn’t just the (excellent) cocktails drawing my eye… I noticed that several of the other diners had ordered burgers, and the burgers looked quite good indeed. So this trip, while I did get a “Sister Mary” (with Tequila, St Germain, Aperol, and grapefruit) my primary goal was to get a burger. And I’ll have to say, the burger alone was worth the trip back here. 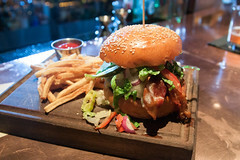 A rich, thick, and juicy coarse-ground burger patty, cooked to a perfect medium rare with a warm pink interior with a crispy exterior, bacon, lettuce, a light touch of sauce, and some house-made pickles made for a really enjoyable burger. Indeed, I enjoyed it almost as much as the one from Craigie on Main down the street. Add in a generous serving of pickled vegetables (including some very nicely done pickled dill green beans), and a pile of nicely done fries, and the result was a burger that was nicely executed, but also didn’t outshine the nice cocktails as well. There are some issues with Brick and Mortar: it is a bit pricey, a bit inconvenient for non-locals (parking will soon be scarce with the new H-Mart opening almost next door), and the place is often crazy busy. But they do two things well: they are a great speakeasy with wonderful cocktails, and they serve one of the areas better burgers. I’ll definitely be back. I’ve been visiting Columbia, MO periodically for more than 20 years, and over those years I’ve gained some favorite places, but it’s a large enough city that there’s a fair bit of turnover in the restaurant scene. Since it’s been several years since my last visit, it’s refreshing to see both that several of my favorite places are still alive and well, and that some some new places have sprung up around town. In this case, when we arrived in town our friends Rob and Sarah were still hard at work, so we decided to tool around downtown and find some lunch. On the north side of the Mizzou campus, we happened across a small pre-fab building with a restaurant that just pulled us in due to our Eastern European heritage (Carol’s background is Polish, mine is Lithuanian): Cafe Poland.